Can you tell my favorite flavor is chocolate!! 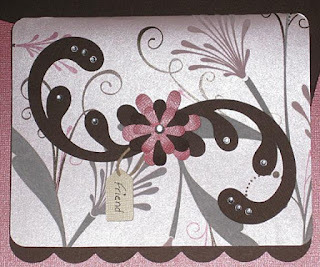 For this challenge I used my favorite flocked paper from Heidi Grace called "Cherrywood", Bazzill "Bittersweet Chocolate", Bazzill Bling "Feather Boa" and "String of Pearls" cardstock and lots of bling. Thanks so much for looking! Please go see what my team mates have created for this challenge. This is great. It's so chic looking. I love it!!!! I forget about all the card cuts on the carts. I'll have to check out this one from Christmas Cheer! The Christmas Cheer card is my fav, I use it all of the time for my cards. I just love the scallops. Thanks for your kind words. WHAT! This is from Christmas Cheer lol!! I have this cart!! I will def. be looking closer now at my cartridges because I'm missing out on alot of things hee hee!! I love this. The colors are fabulous! You did a awesome job!! Lovely card and envie set. 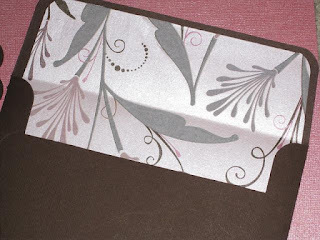 I love the paper and accents.